Bellroy exists to slim your wallet. Rather than bulging pockets and bulky design, our leather wallets are more efficient, have better access, better protection, and even a little old school craft. Featuring a water-resistant zip and heavy-duty leather, the Elements Travel keeps your essentials protected in tricky situations. Inside, there's a travel pen for customs forms, a slot specifically for your passport, room for multiple currencies, and even enough space for your iPhone. Sure beats a beige body belt. If the pen is mightier than the sword, our micro-pen would beat any dagger. It can help get you out of a tight spot when filling custom forms, or scribbling treasure maps. The Elements Travel Wallet not only protects your passport and currency, but can fit most smartphones. Shelter it inside when you're caught in a tricky situation. If you're looking to SCUBA dive with this, it's probably not quite right for you. This wallet works great as a storm-proof wallet rather than a submersible one. 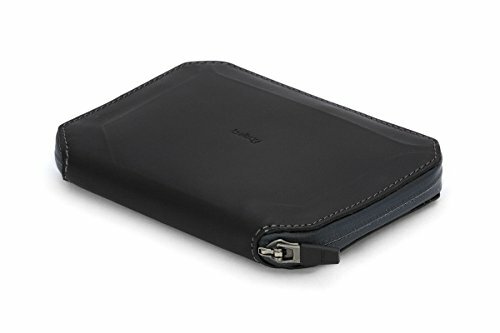 If you have any questions about this product by Bellroy, contact us by completing and submitting the form below. If you are looking for a specif part number, please include it with your message.